Every fall, schools from across America call their former students back to campus to reunite the far-flung members of their extended families. It is a tradition called Homecoming. 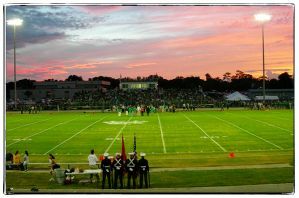 Tampa Catholic has celebrated Homecoming since its early football teams began playing in the 1960's. Unfortunately, the team was never able to play its Homecoming game, or any games at home. Even without a stadium on the campus, the Crusader faithful made where ever they played their home games their field and Crusader Spirit was famous in the Tampa area. Please join your TC family at any or all of the 2017 Homecoming festivities. It’s an annual tradition, a chance to make memories that last a lifetime. Get ready to kick off with Spirit Week and end with the big dance. We hope all our students, alumni and TC families will participate in this year’s events. Check out the dress down days student government has planned; see details for Talent Night; play golf with your parents at the DiMaggio Golf Classic; tailgate with friends and family with dinner from Carrabba’s Italian Grilland watch your Crusader Football team Friday night. It all happens during Homecoming Week! 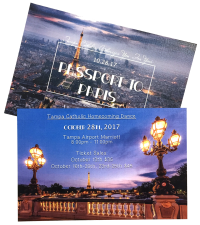 2017 Homecoming Dance - Passport to Paris! An Evening in Paris to be held at the Tampa Airport Marriott on October, 28th, starting at 8:pm. Be sure to invite your BFF or find a creative way to invite your date. Tickets will be on sale during lunch periods on Oct. 16-20th and Oct. 23-25th. Ticket prices are $45 per person. Be sure to download the Homecoming Permission Form and get a jump on ordering your formal portraits by downloading the Studio Artistry order form. We hope to see you in Paris on October 28th! Find out all the details at our Homecoming 2017 webpage! Hope to see you and ALL our TC Alumni there. Tickets for the tailgate dinner and game can be purchased online at the TicketBooth. The dinner is $15 per person or purchase the Combo Ticket for $20 (dinner & game ticket).